strawberry Jello good. Lime Jello BAD. very very bad. As you may be able to tell from the photos below, my grandmother is NOT a big fan of the lime flavoured Jello (click on the picture for a larger version in order to fully appreciate the look. heh). Strawberry, orange, grape... in that order, are her preferences. 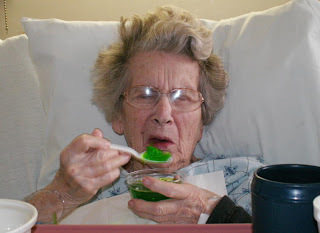 She would have passed on the lime altogether, but when all you get for lunch is 1/2 cup of broth, juice, tea and Jello, you eat the damn Jello. Especially if all you've had for 4 days is an i.v. As the saying goes, beggars can't be choosers. But that was on Friday, and things have changed much since then. My grandma was discharged on Saturday and stayed the night at my parents home. Today she had enough of being away from home (nearly a week since this all started!) and so my mom drove her home to settle in. Now we begin the learning process.... how does one deal with colitis? We just don't know, this is new to the family. I have already ordered a book online and will begin reading up on what foods are best to avoid and how we can control the inflammation in the intestines with diet. Once off the antibiotics her system is on it's own, so it's time to learn about "good foods" and "bad foods". Overall she is in great spirits and happy to be home. The doctor wants to see her again in 3 weeks to follow up and make sure things are ok and after that it will be all about the diet. I thank everyone for your prayers, love and support, it was much appreciated! When I did my usual run up north for work on Monday I went to my grandmother's to stay over night as I always do (aka: Hotel Grandma). However, when I arrived I found her curled up on the couch and writhing in pain. She had been waiting for me to come and help her as she was in too much pain to do anything. She refused to have me take her to the local hospital emergency room, she wanted to go back down to the city (where I live) which is 2 hours away. The snag in all this was that I had a co-worker with me that I am training, and she was staying at a hotel 10 mins away; I couldn't just drop everything unless she was willing to go to a local hospital. On only 5 hours of sleep and 9 hours of driving and working I was tired and unable to just drive back down from whence I came. I called my mom and told her that HER mom was in bad shape. After much discussion my father drove all the way up, picked her up, and drove her all the way down and to the hospital where she has been ever since. She has had a CAT scan and the doctor has determined it's colitis. 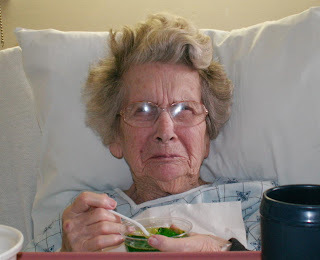 The blood just doesn't circulate in the body as it once did at 87 yrs old and now part of her intestine is not getting blood flow. This is often corrected with surgery but with her age and many health conditions (bad heart, bad lungs, blood issues and allergies to *everything*) she is not a candidate for surgery. I have no idea what we're going to do. Right now the doctor has her on i.v. and no food since Monday morning. She is starving and cranky, as I no doubt would be too. I am excusing myself from work today and tomorrow and will be spending the days at the hospital by her side. I will work the weekend when the family can be there to tag off with me and be with her in my place. I will looking for the doctor today to ask some hard questions. 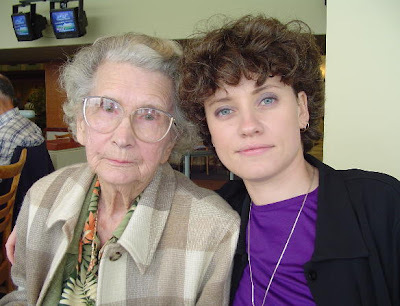 If you are of the mind, please say a prayer for the most awesome grandma ever. Since I wrote last I have flown back from California, worked, worked worked, got 2 speeding tickets (within a block of each other, and within 6 days), 1 parking ticket (20 mins past expired? please.) and had a minor car accident to the tune of $1,200 (a fender bender, really. and no it had nothing to do with the speeding, and I was the one being hit, not doing the hitting). I have acquired a new cell phone that I have a love/hate relationship and have a new laptop on the way that I bought on eBay because my old one died and I need to resurrect some 3,00 pictures from my Israel trip that are on there. I'm trying not to have a stroke about that. Now I am about to leave and catch some 4 flights over the next 24 hrs as my job once again takes me out of town. Mercifully this will be the last time I have to fly to these stores up north, as we have indeed hired a new girl and this will become her territory. There is a light at the end of the tunnel, but it won't be until the end of April after I have her trained and in place. I'm feeling highly motivated to get her trained swiftly. P.S. when I return I will explain the title of this entry... a true quote from the worst day of life a week or two ago, mere minutes after someone hit my car.